Thomas LaRock has written a great article providing a list of a dozen things to check before upgrading and I would definitely suggest making this your first port of call if you’re planning an upgrade. Check it out at: http://pu.gl/61h. The only thing I would add to this list would be to semi-colon terminate your statements if you’re not doing so already. 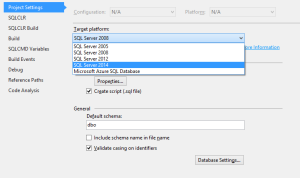 Although this isn’t mandatory in SQL Server 2014, Microsoft have advised that it will be mandatory in a future version. So, if you’re not terminating your Transact-SQL statements this way already, now’s a good time to start. Once you’re happy enough that your database is going to be okay you may, like me, need to upgrade your current Visual Studio database project. Thankfully this is easy enough and can be done by way of an update. You’ll likely see something similar to the following when you look at Project Properties > Project Settings. 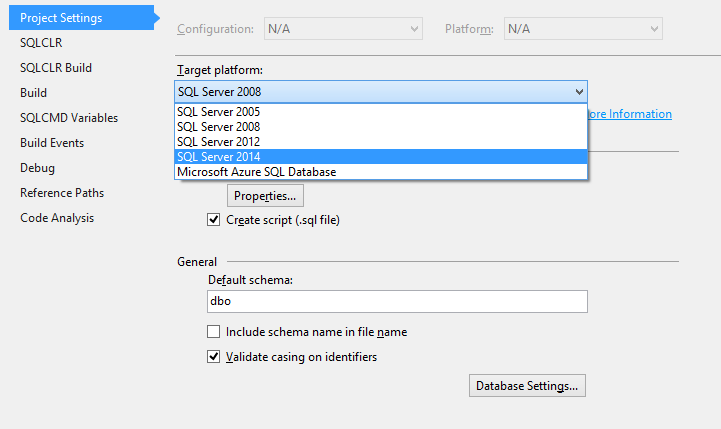 To get SQL Server 2014 available as a target platform in Visual Studio 2013, go to Tools > Extensions and Updates > Updates, click on Updates, then update the Microsoft SQL Server Update option. Once the update has completed, close and re-open your database solution. You should now see SQL Server 2014 in the list of target platforms.